Fifi Lapin is the poshest little bunny to take the UK by storm since Peter Rabbit himself, and she has, since 2007, been giving the fashion world somethin' to talk about. On a weekly basis, Fifi gives us the lowdown on the most fashion-forward looks of the season and most daring trends out there, modeling them on her cute furry bod. For more info on Fifi, click read more. For those of you who may be 'hopping mad' at the idea of a illustration (a rabbit at that) being an object of attention in the fashion community, think again: Fifi is no joke. She has been praised by the likes of Marie Claire, Vogue (American, Australian, and Korean Vogue Girl), and ELLE Magazine being named "the world's most stylish bunny". Even collaborating with Top Shop, ASOS and also (briefly) with Le Sportsac, producing an uber-adorable line of bags and pouches; Fifi is no doubt on top of the style game. You may wonder who is behind all this 'genius', but the creator of Fifi is still unknown. The fact that they have chosen to remain anonymous has allowed them to truly breathe life into this character. A truly bold move if I do say so myself. 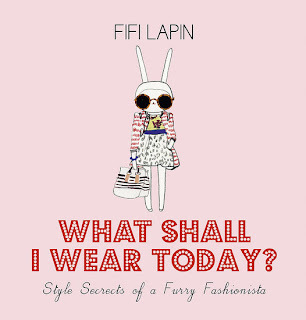 Fifi Lapin's book "What Shall I Wear Today? : Style Secrets of a Furry Fashionista" which as silly as it sounds, is definitely on my book list. My only wish is that more of her merchandise was made available in the US. Right now you can purchase the newest line of Fifi covered t-shirts and totes on the french website, www.Pimkie.fr. 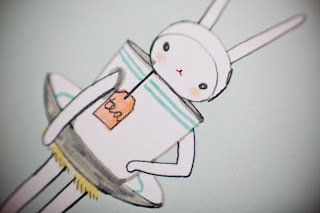 Check out her website, fifi-lapin.blogspot.com, for all the cute details.